Large structures are built with expansion joints which allow them some leeway to expand and contract without causing any damage. When a substance is heated up, its particles move more and it takes up a larger volume – this is known as thermal expansion. Conversely, a drop in temperature causes it to contract again. The mercury level inside a thermometer, for example, rises and falls as the mercury’s volume changes with the ambient temperature. 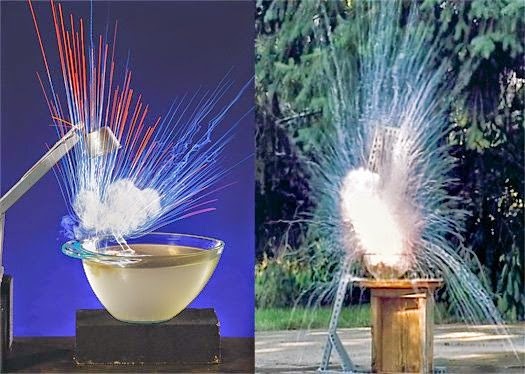 This effect is most dramatic in gases but occurs in liquids and solids such as iron too. For this reason large structures such as bridges are built with expansion joints which allow them some leeway to expand and contract without causing any damage. Hawaii’s pace is comparable to the speed at which our fingernails grow. The Earth’s crust is split into gigantic pieces called tectonic plates. These plates are in constant motion, propelled by currents in the Earth’s upper mantle. Hot, less-dense rock rises before cooling and sinking, giving rise to circular convection currents which act like giant conveyor belts, slowly shifting the tectonic plates above them. Hawaii sits in the middle of the Pacific Plate, which is slowly drifting north-west towards the North American Plate, back to Alaska. The plates’ pace is comparable to the speed at which our fingernails grow. Chalk is made from single-celled algae that lived in Earth’s oceans for 200 million years. Tiny single-celled algae called coccolithophores have lived in Earth’s oceans for 200 million years. Unlike any other marine plant, they surround themselves with minuscule plates of calcite (coccoliths). Just under 100 million years ago, conditions were just right for coccolithophores to accumulate in a thick layer coating ocean floors in a white ooze. As further sediment built up on top, the pressure compressed the coccoliths to form rock, creating chalk deposits such as the white cliffs of Dover. Coccolithophores are just one of many prehistoric species that have been immortalised in fossil form, but how do we know how old they are? Over time, rock forms in horizontal layers, leaving older rocks at the bottom and younger rocks near the top. By studying the type of rock in which a fossil is found palaeontologists can roughly guess its age. Carbon dating estimates a fossil’s age more precisely, based on the rate of decay of radioactive elements such as carbon-14. Our planet will eventually become a vast desert similar to Mars today. Over the coming hundreds of millions of years, the Sun will continue to get progressively brighter and hotter. In just over 2 billion years, temperatures will be high enough to evaporate our oceans, making life on Earth impossible. Our planet will become a vast desert similar to Mars today. As it expands into a red giant in the following few billion years, scientists predict that the Sun will finally engulf Earth altogether, spelling the definite end for our planet. Polar bears keep warm due to a thick layer of blubber under the skin. Thermal cameras detect the heat lost by a subject as infrared, but polar bears are experts at conserving heat. The bears keep warm due to a thick layer of blubber under the skin. Add to this a dense fur coat and they can endure the chilliest Arctic day. It takes five and a half hours for the Sun’s light to reach Pluto. The atoms that make up the world around us seem solid, but are in fact over 99.99999 per cent empty space. An atom consists of a tiny, dense nucleus surrounded by a cloud of electrons, spread over a proportionately vast area. This is because as well as being particles, electrons act like waves. Electrons can only exist where the crests and troughs of these waves add up correctly. And instead of existing in one point, each electron’s location is spread over a range of probabilities – an orbital. They thus occupy a huge amount of space. Your stomach digests food thanks to highly corrosive hydrochloric acid with a pH of 2 to 3. This acid also attacks your stomach lining, which protects itself by secreting an alkali bicarbonate solution. The lining still needs to be replaced continually, and it entirely renews itself every four days. The Earth’s magnetic field is used by compass needles worldwide. Earth’s inner core is a sphere of solid iron, surrounded by liquid iron. Variations in temperature and density create currents in this iron, which in turn produce electrical currents. Lined up by the Earth’s spin, these currents combine to create a magnetic field, used by compass needles worldwide. Venus was likely knocked off course by a gigantic asteroid.